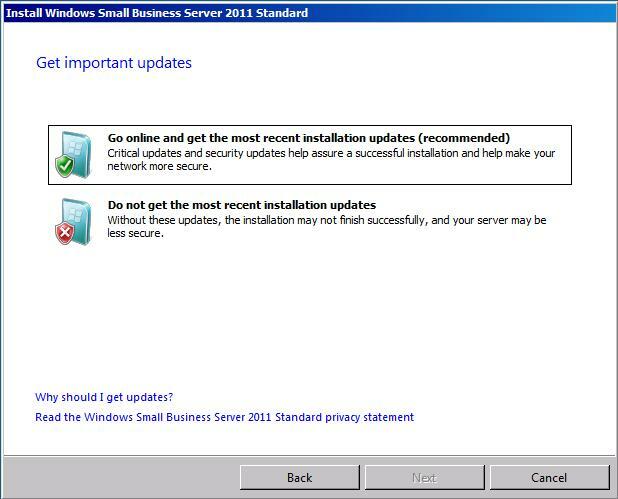 Since Windows Small Business Server 2011 is rtm’d for a couple of weeks. I would like to take a look at the installation process and after that the typical SBS configuration wizards. Because all of this will be a very long post I will cut it in several parts. Before you even start with the installation make sure your hardware meets the system requirements. 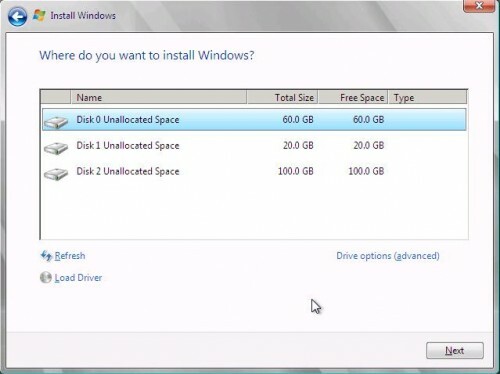 Important note: If you have less than 4 GB or your system partition is smaller than 80 GB the installation cannot be continued at a later point and you will have to start over again. If your hardware meets the requirements let’s put in the dvd or mount the iso file if you install on a virtual machine. Now the first screen appears, choose your, language, time and currency and the keyboard settings you would like to use. I got this window installing SBS 2011 on a Virtual Machine, but I have no clue why it appears because there is not upgrade possibility. So the only logical choice is to choose custom. 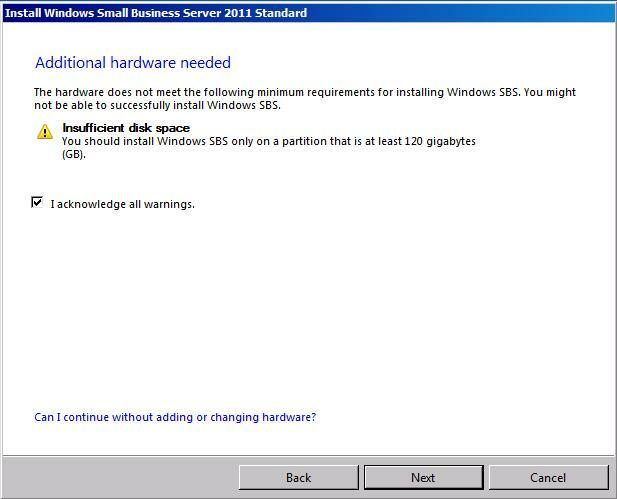 So now we have to choose the partition to install SBS 2011. Keep in mind that if you choose a partition smaller than 80 GB the installation will further on come to a point you cannot continue. If your partition is between 80 and 120 GB you will receive a warning, but you can continue. If you see no partitions at all you can choose load driver to load the right 3rd party driver for your storage controller. 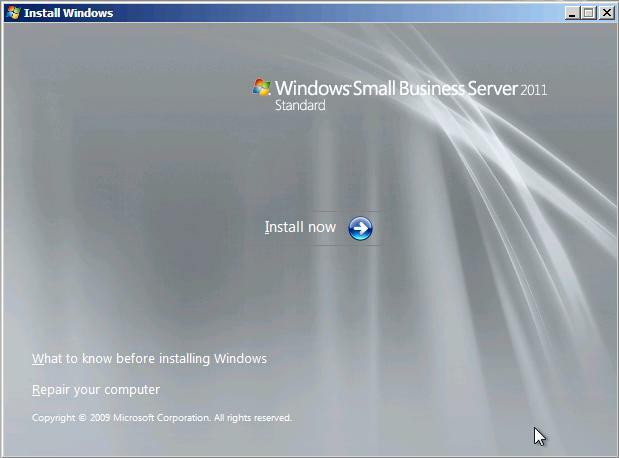 This is the part where the Windows (SBS 2011 is build on Windows 2008 R2) installation takes place. 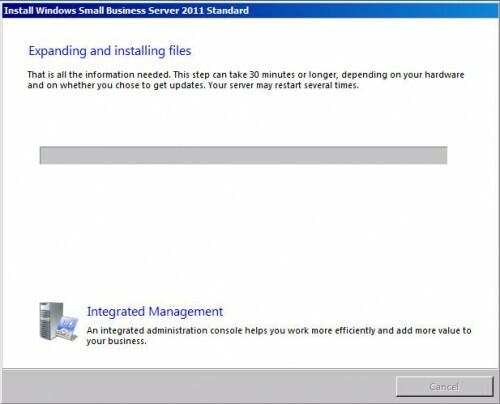 During installation the server has to restart a couple of times, this all goes automatically, so just wait. When the installation part is finished this screen will appear. This is screen is new compared to SBS 2008. You will also get this screen so no more completely starting over if you are doing a migration and the usb key answer file is not detected. For now we are going to do a Clean Install. Maybe later I will spend some time on the migration option, for now I can only point you to this Microsoft technet article. This is the point where you will receive an error if you have less than 4GB physical memory or you installation partition is smaller than 80 GB. I have written about this here. Now my partition is between the 80 and 120 GB and I can acknowledge the warning and continue. 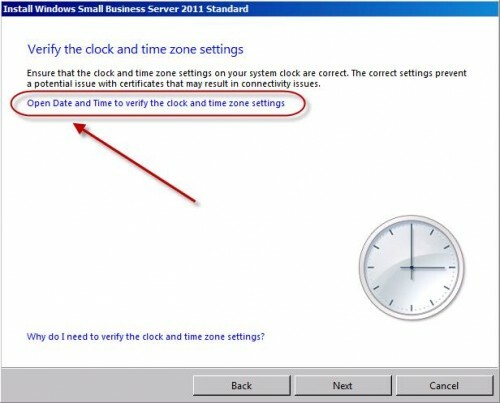 Here you can check the date, time and time zone settings. If you are installing SBS 2011 as a Hyper-V virtual machine and time synchronization with the parent is enabled these settings will have to match otherwise the installation will end up with errors. Read more about this over here. Manually configure or let the setup automatically configure your network settings. If you choose to get the most recent installation updates (recommended) option this will make the installation time seriously longer. 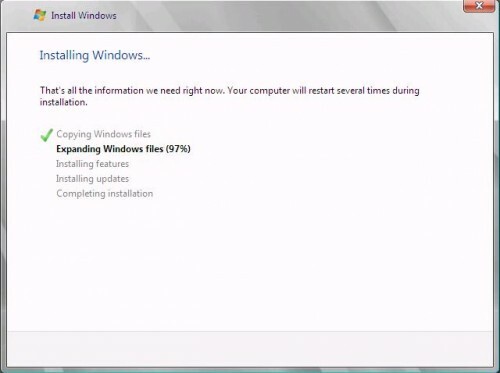 It is no problem to install updates after installation is finished. 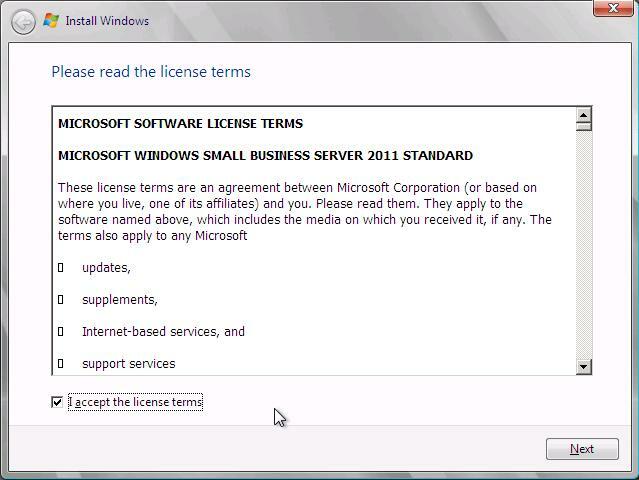 These fields are all optional, but are used at some places in your SBS 2011 installation. You can edit or fill in the information later on after installation. Now we give the server and domain a name. 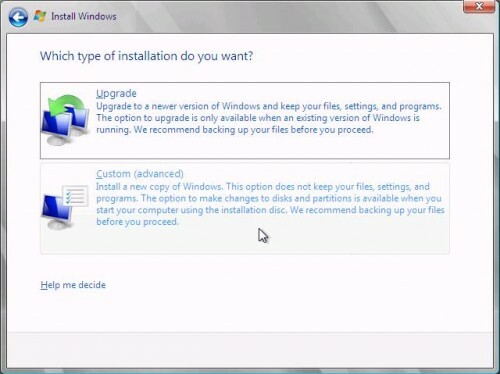 Please take a moment to think about what you choose here because it cannot be changed after installation finished. 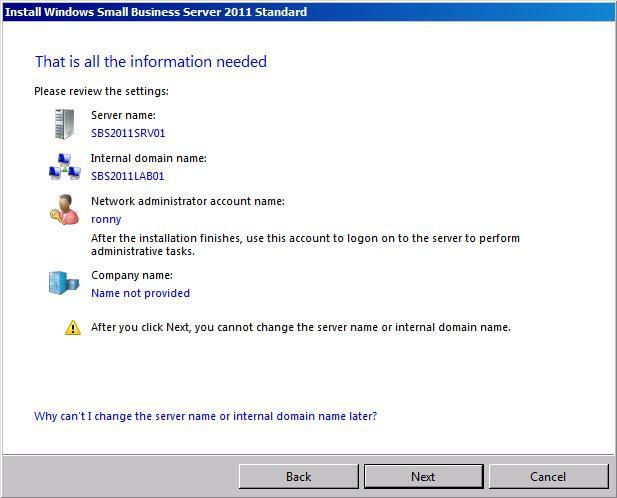 Since Windows 2008 the build-in Administrator account will be disabled. The account you create here will be your Administrator account to control you SBS 2011 server, so make sure you choose a username and password you can remember. This overview is the last chance to go back and change some setting after you click next it isn’t possible anymore. 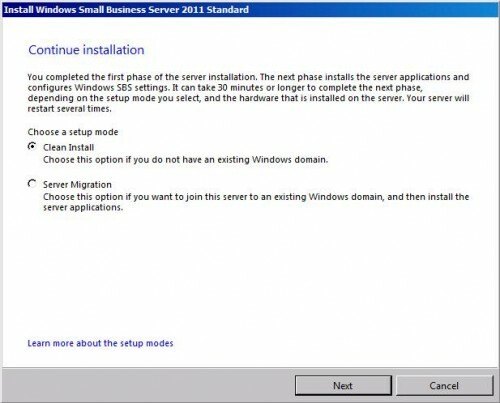 This is the SBS 2011 installation part and would take depending on your hardware more than 30 minutes. The server will restart at least one time during installation. After installation has finished and you logon for the first time you will receive this window “Succesful installation”. Posted in Blog, Howto, SBS 2011 by ronnypot at January 8th, 2011.
on the Completing Installation. I can´t get over this step. I’ve had a similar issue with VMWare 6.5. – Check whether your Network Card is connected. – If you are a bridged VMWare connection, check whether the network bridge is running. – Create a snapshot (of the complete installation hanging state), power off the Virtual Machine, then restore the snapshot – this solved my issue. Thank you so much for this series, ronnypot. It is most useful! 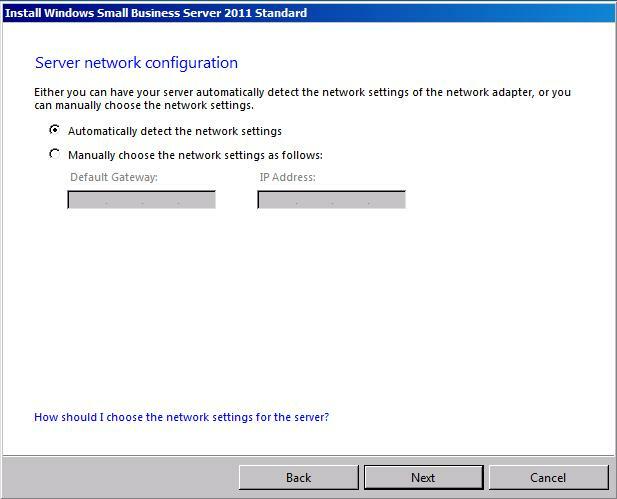 May I ask you to clarify for me what to input in the “Server network configuration” screen? Specifically, if we choose the ‘Manual” option, then are we to enter the EXTERNAL ip address of our server (which I have from my isp) and the ip address of my ISP’s gateway? Or am I supposed to enter the INTERNAL ip address I want my server to have (e.g. : 192.168.32.2 for the server and the gateway)? 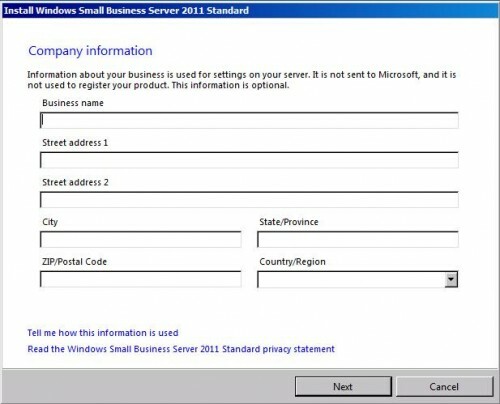 What is ment within this screen is the internal ip address for your server and the internal gateway given to the server. What happens when you need to install LAN drivers first? It won’t let me continue until it finds a network connection. Which it never will if my LAN drivers aren’t installed! Using an AMD A75 Chipset. Never had to install a server without a driver, because HP servers always install with the smart start cd this installs all drivers needed for installation. But if the setup holds there are 2 things that might help, you can try to press this should open a command prompt or press choose task manager, new task and in both case run explorer.exe go to control panel, go to device manager and you should be able to install the driver and continue setup. Hi Vispor, I had the same issue when installing SBS2011. I ended up downloading the appropriate LAN drivers from my Win7 desktop and burned them to a DVD drive. Then when the installation prompts for network drivers, I just popped out the SBS2011 installation CD and popped in the one for my NIC. Hit browse and ran the setup.exe file from the DVD. Everything installed beautifully! 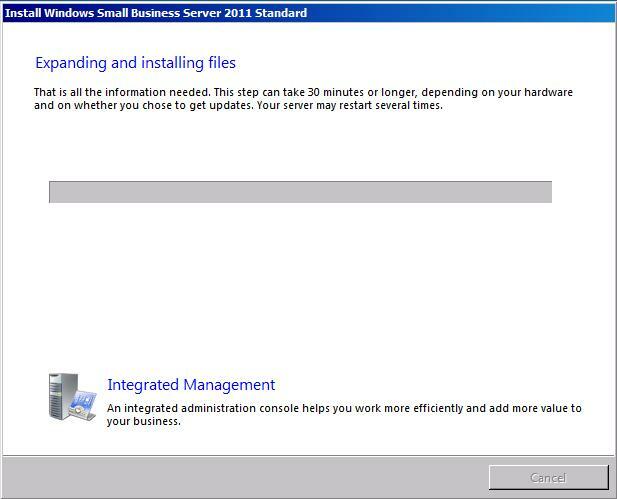 The server rebooted and the SBS2011 installation came right back up and let me continue. I’m sure you’ve installed everything by now, but just in case someone else experiences this issue, they’ll have an idea on how to fix. 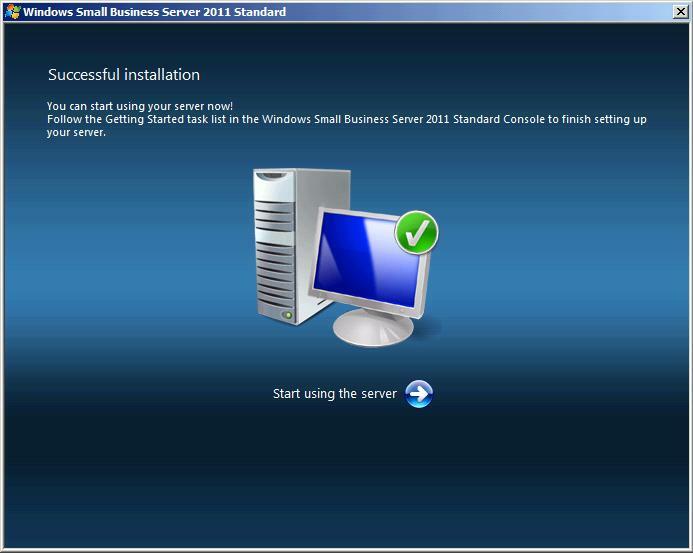 I installed SBS 2011 Standard and installation went on well with dns installed. When I try to join the client computer I get the user name and password box pop up but when I put the credential I get error message that problem with locating DNS. is the client using the DNS of the SBS server? The client is running windows 7.
and another I crunert have a client that has has 4 servers with various microsoft technologies on themThey are a perfect fit for EBS as far as i can seeWill there any migration/upgrade/side-grade(!) paths or would that have to start from scratch again? 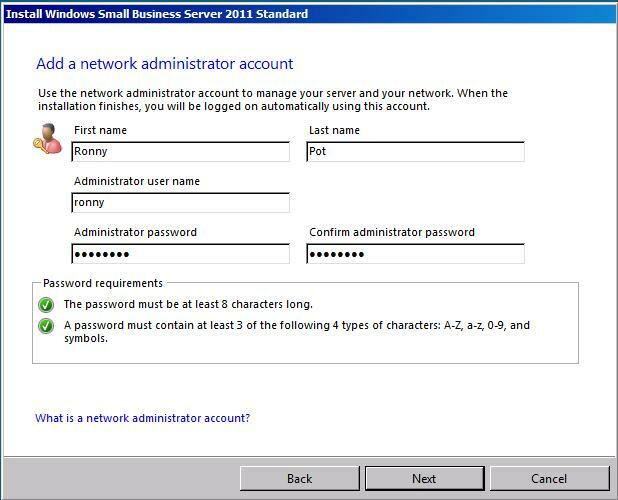 as the EBS is discontinued you either have to check if you can fit in for SBS and its 75 user or device limitation. Otherwise you have to go for the windows server standard or enterprise products. Migrations would be the same as multiple standard servers there is no documentation but the SBS documents would guide you. Best would be to create a test environment if your production environment and do a test migration. 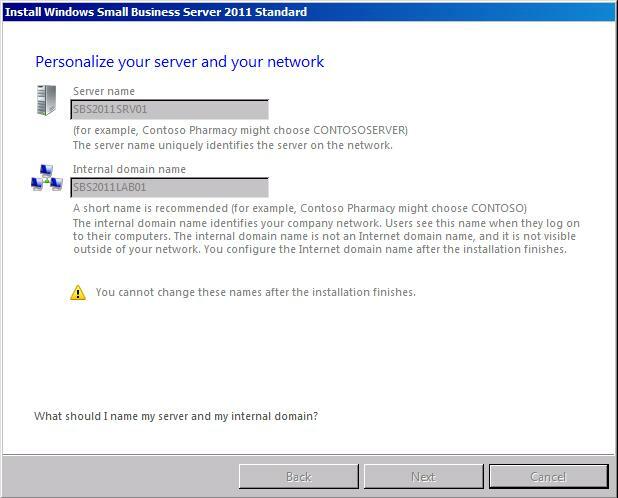 I am trying to install SMB 2011 Essential however, I am getting all sorts of problems from Nic driver not found to invalid partition table. please help. Are you trying to install the server on decent server hardware? And is the Nic a default know device by windows or are you installing drivers after SBS is installed? Yes both domain names could be identical, only is it is recommended you use not the external domain name for the internal domain. So internal should be horpey.local and horpey.com for the internet domain name. So if internal reads Horpey.local, what will users email address be? I want my user email address to be “xyz@Horpey.com”. Wouldn’t I have issue while trying to configure users’ on outlook? 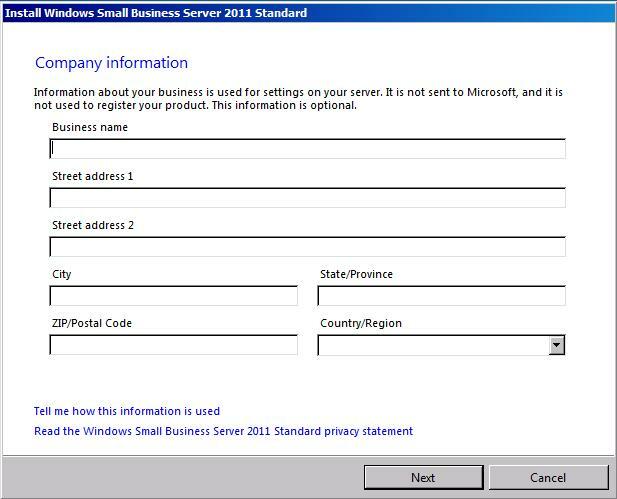 to clarify, horpey.local is the sbs domain name it is the Active Directory domain name. Horpey.com is the email domain name configured in exchange only for E-mail. Both have nothing to with each other, they are completly seperated.